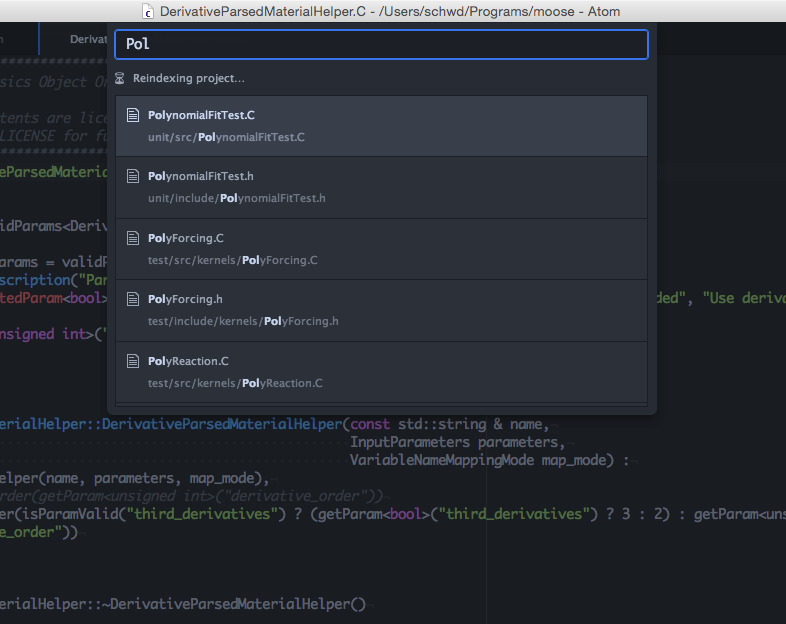 Start Atom for the first time and select _Atom->Install Shell Commands_. 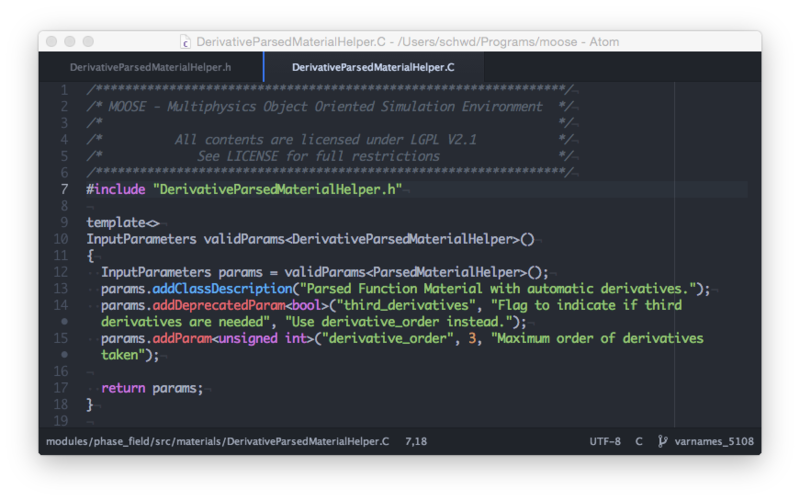 This activates the atom and apm shell commands for use from a terminal. Close Atom. From now on we will only start it from our MOOSE project directories using atom ensuring that Atom sees the full MOOSE build environment. Autocompletion for MOOSE input files. switch-header-source: Use Ctrl-Alt-S to switch between corresponding header and source files. language-moose: Syntax highlighting and automatic indentation for MOOSE input files, C++ code snippets for all MOOSE systems, and highlighting of select MOOSE C++ types. autocomplete-moose: Context sensitive autocompletion for MOOSE input files. make-runner: Press Ctrl-R to build the current project from within Atom. Features clickable compile error messages to jump straight to the locations with the compile errors. autocomplete-clang: Type-aware C++ autocompletion. Use make clang_complete in your project directory to generate the necessary configuration file. clang-format: Uses clang-format with the custom MOOSE style rules to format your code. Can be set to reformat automatically when saving or manually by pressing Cmd-Shift-K.
MOOSE_UNITY=false make compile_commands.json && rc -J . You can now press alt+, in Atom with the cursor on any symbol (even macros) to jump to its declaration courtesy of the _atomic-rtags_ package.